Obverse: Design of the banknotes consist the various architectural elements of Art Moderne style. On the obverse is the text: «ГОСУДАРСТВЕННЫЙ КРЕДИТНЫЙ БИЛЕТЪ. СТО РУБЛЕЙ. (STATE CREDIT NOTE. ONE HUNDRED RUBLES) and the relief panel with text: «Государственный Банкъ размѣниваетъ кредитные билеты на золотую монету безъ ограниченія суммы (1 рубль = 1/15 имперіала, содержитъ 17,424 долей чистаго золота)». (The State Bank exchanges state credit notes for gold coin without restrictions as to the total value (1 rouble = 1/15 Imperial, equals 17,424 dols of pure gold). (dols; dolia = 44.435 mg)). Signatures of the Governor of State Bank - Ivan Pavlovich Shipov and one of the cashiers - Metz. The Imperial Crown of Russia above the Imperial Monogram of Tsar Nicholas II of Russia in a laurel wreath above the relief panel with the face value in large arabic numeral "100" at right. The Imperial Coat of Arms of the Russian Empire, 1883 - Imperial Double-Headed Eagle in a laurel wreath above the relief panel with Russian (cyrillic) text: "Extract from the Highest Manifesto of 14 November 1897, relating to the issue of state credit notes" at left. Reverse: Portrait of Catherine II (1729 – 1796), also known as Catherine the Great, born Princess Sophie of Anhalt-Zerbst, was Empress of Russia from 1762 until 1796, the country's longest-ruling female leader. The portrait was painted by by Johann Baptist von Lampi the Elder, circa 1792. The Imperial Monogram of Catherine II the Great of Russia in a laurel wreath at center and allegorical man with sword at left. Withdrawn from circulation: Formally in circulation until October 1, 1922, according to the Decree of the Council of People's Commissars of September 8, 1922, they lost their payment power. Watermark: Portrait of Catherine II. Catherine II (Russian: Екатерина Алексеевна Yekaterina Alekseyevna; 2 May [O.S. 21 April] 1729 – 17 November [O.S. 6 November] 1796), also known as Catherine the Great (Екатери́на Вели́кая, Yekaterina Velikaya), born Princess Sophie of Anhalt-Zerbst, was Empress of Russia from 1762 until 1796, the country's longest-ruling female leader. She came to power following a coup d'état when her husband, Peter III, was assassinated. Under her reign, Russia was revitalised; it grew larger and stronger, and was recognised as one of the great powers of Europe. In both her accession to power and in rule of her empire, Catherine often relied on her noble favourites, most notably Grigory Orlov and Grigory Potemkin. Assisted by highly successful generals such as Alexander Suvorov and Pyotr Rumyantsev, and admirals such as Fyodor Ushakov, she governed at a time when the Russian Empire was expanding rapidly by conquest and diplomacy. In the south, the Crimean Khanate was crushed following victories over the Ottoman Empire in the Russo-Turkish wars, and Russia colonised the territories of Novorossiya along the coasts of the Black and Azov Seas. In the west, the Polish–Lithuanian Commonwealth, ruled by Catherine's former lover, king Stanisław August Poniatowski, was eventually partitioned, with the Russian Empire gaining the largest share. In the east, Russia started to colonise Alaska, establishing Russian America. Catherine reformed the administration of Russian guberniyas, and many new cities and towns were founded on her orders. An admirer of Peter the Great, Catherine continued to modernise Russia along Western European lines. However, military conscription and the economy continued to depend on serfdom, and the increasing demands of the state and private landowners led to increased levels of reliance on serfs. This was one of the chief reasons behind several rebellions, including the large-scale Pugachev's Rebellion of cossacks and peasants. The period of Catherine the Great's rule, the Catherinian Era, is often considered the Golden Age of the Russian Empire and the Russian nobility. The Manifesto on Freedom of the Nobility, issued during the short reign of Peter III and confirmed by Catherine, freed Russian nobles from compulsory military or state service. Construction of many mansions of the nobility, in the classical style endorsed by the Empress, changed the face of the country. She enthusiastically supported the ideals of The Enlightenment, thus earning the status of an enlightened despot. As a patron of the arts she presided over the age of the Russian Enlightenment, a period when the Smolny Institute, the first state-financed higher education institution for women in Europe, was established. Russia at the time was ruled by Peter the Great’s daughter, the empress Elizabeth, whose 20-year reign greatly stabilized the monarchy. Devoted to much pleasure and luxury and greatly desirous of giving her court the brilliancy of a European court, Elizabeth prepared the way for Catherine. Catherine, however, would not have become empress if her husband had been at all normal. He was extremely neurotic, rebellious, obstinate, perhaps impotent, nearly alcoholic, and, most seriously, a fanatical worshipper of Frederick II of Prussia, the foe of the empress Elizabeth. Catherine, by contrast, was clearheaded and ambitious. Her intelligence, flexibility of character, and love of Russia gained her much support. She was humiliated, bored, and regarded with suspicion while at court, but she found comfort in reading extensively and in preparing herself for her future role as sovereign. Although a woman of little beauty, Catherine possessed considerable charm, a lively intelligence, and extraordinary energy. During her husband’s lifetime alone, she had at least three lovers; if her hints are to be believed, none of her three children, not even the heir apparent Paul, was fathered by her husband. Her true passion, however, was ambition; since Peter was incapable of ruling, she saw quite early the possibility of eliminating him and governing Russia herself. The empress Elizabeth died on December 25, 1761 (January 5, 1762, New Style), while Russia, allied with Austria and France, was engaged in the Seven Years’ War against Prussia. Shortly after Elizabeth’s death, Peter, now emperor, ended Russia’s participation in the war and concluded an alliance with Frederick II of Prussia. He made no attempt to hide his hatred of Russia and his love of his native Germany; discrediting himself endlessly by his foolish actions, he also prepared to rid himself of his wife. Catherine had only to strike: she had the support of the army, especially the regiments at St. Petersburg, where Grigory Orlov, her lover, was stationed; the court; and public opinion in both capitals (Moscow and St. Petersburg). She was also supported by the “enlightened” elements of aristocratic society, since she was known for her liberal opinions and admired as one of the most cultivated persons in Russia. On June 28 (July 9, New Style), 1762, she led the regiments that had rallied to her cause into St. Petersburg and had herself proclaimed empress and autocrat in the Kazan Cathedral. Peter III abdicated and was assassinated eight days later. Although Catherine probably did not order the murder of Peter, it was committed by her supporters, and public opinion held her responsible. In September 1762, she was crowned with great ceremony in Moscow, the ancient capital of the tsars, and began a reign that was to span 34 years as empress of Russia under the title of Catherine II. Despite Catherine’s personal weaknesses, she was above all a ruler. Truly dedicated to her adopted country, she intended to make Russia a prosperous and powerful state. 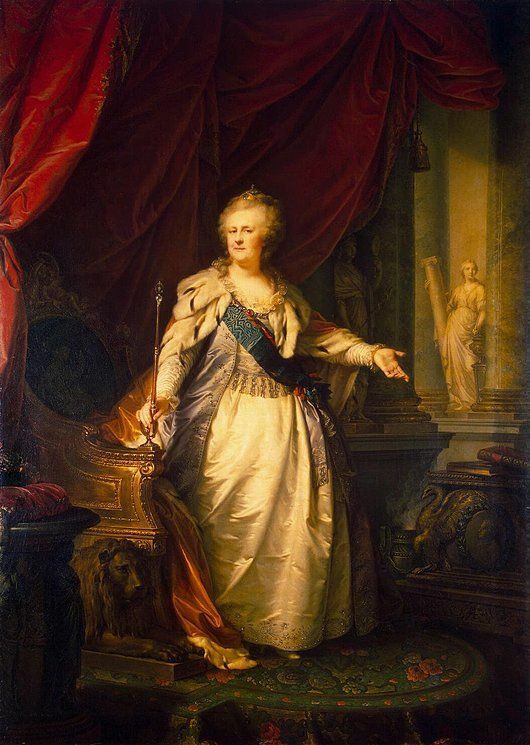 Since her early days in Russia she had dreamed of establishing a reign of order and justice, of spreading education, creating a court to rival Versailles, and developing a national culture that would be more than an imitation of French models. Her projects obviously were too numerous to carry out, even if she could have given her full attention to them. Her most pressing practical problem, however, was to replenish the state treasury, which was empty when Elizabeth died; this she did in 1762 by secularizing the property of the clergy, who owned one-third of the land and serfs in Russia. The Russian clergy was reduced to a group of state-paid functionaries, losing what little power had been left to it by the reforms of Peter the Great. Since her coup d’etat and Peter’s suspicious death demanded both discretion and stability in her dealings with other nations, she continued to preserve friendly relations with Prussia, Russia’s old enemy, as well as with the country’s traditional allies, France and Austria. In 1764 she resolved the problem of Poland, a kingdom lacking definite boundaries and coveted by three neighbouring powers, by installing one of her old lovers, Stanisław Poniatowski, a weak man entirely devoted to her, as king of Poland. Her attempts at reform, however, were less than satisfying. A disciple of the English and French liberal philosophers, she saw very quickly that the reforms advocated by Montesquieu or Jean-Jacques Rousseau, which were difficult enough to put into practice in Europe, did not at all correspond to the realities of an anarchic and backward Russia. In 1767 she convened a commission composed of delegates from all the provinces and from all social classes (except the serfs) for the purpose of ascertaining the true wishes of her people and framing a constitution. The debates went on for months and came to nothing. Catherine’s Instruction to the commission was a draft of a constitution and a code of laws. It was considered too liberal for publication in France and remained a dead letter in Russia. Frustrated in her attempts at reform, Catherine seized the pretext of war with Turkey in 1768 to change her policy; henceforth, emphasis would be placed above all on national grandeur. Since the reign of Peter the Great, the Ottoman Empire had been the traditional enemy of Russia; inevitably, the war fired the patriotism and zeal of Catherine’s subjects. Although the naval victory at Çeşme in 1770 brought military glory to the empress, Turkey had not yet been defeated and continued fighting. At that point, Russia encountered unforeseen difficulties. First, a terrible plague broke out in Moscow; along with the hardships imposed by the war, it created a climate of disaffection and popular agitation. In 1773 Yemelyan Pugachov, a former officer of the Don Cossacks, pretending to be the dead emperor Peter III, incited the greatest uprising of Russian history prior to the revolution of 1917. Starting in the Ural region, the movement spread rapidly through the vast southeastern provinces, and in June 1774 Pugachov’s Cossack troops prepared to march on Moscow. At this point, the war with Turkey ended in a Russian victory, and Catherine sent her crack troops to crush the rebellion. Defeated and captured, Pugachov was beheaded in 1775, but the terror and chaos he inspired were not soon forgotten. Catherine now realized that for her the people were more to be feared than pitied, and that, rather than freeing them, she must tighten their bonds. Before her accession to power, Catherine had planned to emancipate the serfs, on whom the economy of Russia, which was 95 percent agricultural, was based. The serf was the property of the master, and the fortune of a noble was evaluated not in lands but in the “souls” he owned. When confronted with the realities of power, however, Catherine saw very quickly that emancipation of the serfs would never be tolerated by the owners, whom she depended upon for support, and who would throw the country into disorder once they lost their own means of support. Reconciling herself to an unavoidable evil without much difficulty, Catherine turned her attention to organizing and strengthening a system that she herself had condemned as inhuman. She imposed serfdom on the Ukrainians who had until then been free. By distributing the so-called crown lands to her favourites and ministers, she worsened the lot of the peasants, who had enjoyed a certain autonomy. At the end of her reign, there was scarcely a free peasant left in Russia, and, because of more systematized control, the condition of the serf was worse than it had been before Catherine’s rule. Thus, 95 percent of the Russian people did not in any way benefit directly from the achievements of Catherine’s reign. Rather, their forced labour financed the immense expenditures required for her ever-growing economic, military, and cultural projects. In these undertakings, at least, she proved herself to be a good administrator and could claim that the blood and sweat of the people had not been wasted. In 1774, the year of Russia’s defeat of Turkey, Grigory Potemkin, who had distinguished himself in the war, became Catherine’s lover, and a brilliant career began for this official of the minor nobility, whose intelligence and abilities were equalled only by his ambition. He was to be the only one of Catherine’s favourites to play an extensive political role. Ordinarily, the empress did not mix business and pleasure; her ministers were almost always selected for their abilities. In Potemkin she found an extraordinary man whom she could love and respect and with whom she could share her power. As minister he had unlimited powers, even after the end of their liaison, which lasted only two years. Potemkin must be given part of the credit for the somewhat extravagant splendour of Catherine’s reign. He had a conception of grandeur that escaped the rather pedestrian German princess, and he understood the effect it produced on the people. A great dreamer, he was avid for territories to conquer and provinces to populate; an experienced diplomat with a knowledge of Russia that Catherine had not yet acquired and as audacious as Catherine was methodical, Potemkin was treated as an equal by the empress up to the time of his death in 1791. They complemented and understood each other, and the ambitious minister expressed his respect for his sovereign through complete devotion to her interests. The annexation of Crimea from the Turks in 1783 was Potemkin’s work. Through that annexation and the acquisition of the territories of the Crimean khanate, which extended from the Caucasus Mountains to the Bug River in southwestern Russia, Russia held the north shore of the Black Sea and was in a position to threaten the existence of the Ottoman Empire and to establish a foothold in the Mediterranean. Catherine also sought to renew the alliance with Austria, Turkey’s neighbour and enemy, and renounced the alliance with Prussia and England, who were alarmed by Russian ambitions. Yet, during Catherine’s reign, the country did not become involved in a European war, because the empress scrupulously adhered to the territorial agreements she had concluded with several western European nations. Catherine’s glorification reached its climax in a voyage to Crimea arranged by Potemkin in 1787. In a festive Arabian Nights atmosphere, the empress crossed the country to take possession of her new provinces; the emperor of Austria, the king of Poland, and innumerable diplomats came to honour her and to enjoy the splendours of what became known as “Cleopatra’s fleet” because Catherine and her court traveled partly by water. She dedicated new towns bearing her name and announced that she ultimately intended to proceed to Constantinople. Catherine, like all the crowned heads of Europe, felt seriously threatened by the French Revolution. The divine right of royalty and the aristocracy was being questioned, and Catherine, although a “friend of the Enlightenment,” had no intention of relinquishing her own privileges: “I am an aristocrat, it is my profession.” In 1790 the writer A.N. Radishchev, who attempted to publish a work openly critical of the abuses of serfdom, was tried, condemned to death, then pardoned and exiled. Ironically, the sentiments Radishchev expressed were very similar to Catherine’s Instruction of 1767. Next, Poland, encouraged by the example of France, began agitating for a liberal constitution. In 1792, under the pretext of forestalling the threat of revolution, Catherine sent in troops and the next year annexed most of the western Ukraine, while Prussia helped itself to large territories of western Poland. After the national uprising led by Thaddeus Kosciuszko in 1794, Catherine wiped Poland off the map of Europe by dividing it between Russia, Prussia, and Austria in 1795. Catherine’s last years were darkened by the execution of Louis XVI, the advance of the revolutionary armies, and the spread of radical ideas. The empress realized, moreover, that she had no suitable successor. She considered her son Paul an incompetent and unbalanced man; her grandson Alexander was too young yet to rule. Russians, even Soviet Russians, continue to admire Catherine, the German, the usurper and profligate, and regard her as a source of national pride. Non-Russian opinion of Catherine is less favourable. Because Russia under her rule grew strong enough to threaten the other great powers, and because she was in fact a harsh and unscrupulous ruler, she figured in the Western imagination as the incarnation of the immense, backward, yet forbidding country she ruled. One of Catherine’s principal glories is to have been a woman who, just as Elizabeth I of England and Queen Victoria gave their names to periods of history, became synonymous with a decisive epoch in the development of her country. At the end of Catherine’s reign, Russia had expanded westward and southward over an area of more than 200,000 square miles, and the Russian rulers’ ancient dream of access to the Bosporus Strait (connecting the Black Sea with the Aegean) had become an attainable goal. At the end of her reign Catherine claimed that she had reorganized 29 provinces under her administrative reform plan. An uninhibited spender, she invested funds in many projects. More than a hundred new towns were built; old ones were expanded and renovated. As commodities were plentiful, trade expanded and communications developed. These achievements, together with the glory of military victories and the fame of a brilliant court, to which the greatest minds of Europe were drawn, have won her a distinguished place in history. Catherine’s critics acknowledge her energy and administrative ability but point out that the achievements of her reign were as much due to her associates and to the unaided, historical development of Russian society as to the merits of the empress. And when they judge Catherine the woman, they treat her severely. Her private life was admittedly not exemplary. She had young lovers up to the time of her unexpected death from a stroke at the age of 67. After the end of her liaison with Potemkin, who perhaps was her morganatic husband, the official favourite changed at least a dozen times; she chose handsome and insignificant young men, who were only, as one of them himself said, “kept girls.” Although in reality devoted to power above all else, she dreamed endlessly of the joys of a shared love, but her position isolated her. She did not love her son Paul, the legitimate heir, whose throne she occupied. On the other hand, she adored her grandsons, particularly the eldest, Alexander, whom she wished to succeed her. In her friendships she was loyal and generous and usually showed mercy toward her enemies. Yet it cannot be denied that she was also egotistical, pretentious, and extremely domineering, above all a woman of action, capable of being ruthless when her own interest or that of the state was at stake. As she grew older she also became extremely vain: there was some excuse, as the most distinguished minds of Europe heaped flatteries on her that even she ultimately found exaggerated. A friend of Voltaire and Denis Diderot, she carried on an extensive correspondence with most of the important personages of her time. She was a patron of literature and a promoter of Russian culture; she herself wrote, established literary reviews, encouraged the sciences, and founded schools. Her interests and enthusiasms ranged from construction projects to lawmaking and the collection of art objects; she touched on everything, not always happily but always passionately. She was a woman of elemental energy and intellectual curiosity, desiring to create as well as to control. In 1773 he went to Trento, where he learned to become a portraitist in canvases and miniatures. He travelled to Innsbruck, then to Vienna, where the Emperor Joseph II appointed him a professor at the Vienna Academy in 1786. That same year, he was invited to Warsaw by the court of King Stanisław II Augustus. He worked in Warsaw until the complete military Partitions of Poland. In 1791, he moved to St. Petersburg where the Czar gave him a hereditary knighthood. In Russia he devoted himself to portrait painting, and amassed a large fortune. He painted the Empress Catherine II and Empress Maria Fedorovna among other aristocrats. He returned to Vienna in 1797 and became its honorary citizen in 1799. Pensioned in 1822, he died at Vienna on February 11, 1830.